It’s not often Oregon has a Heisman finalist. Joey Harrington finished 4th in 2001, LaMicheal James 3rd in 2010, and, of course, Marcus Mariota won the award this year. But 2015 could see the Ducks with back-to-back finalists for the first time in school history. 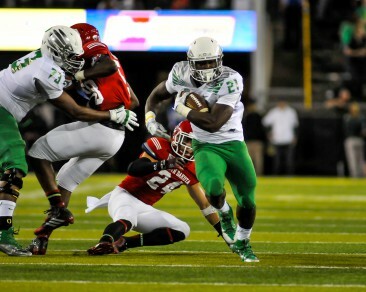 Royce Freeman burst onto the scene last year as a true freshman, totaling 1,365 yards and 18 touchdowns. Freeman certainly looks the part, standing almost 6’1″ and weighing in around 230 pounds; he is a physical inside runner with a great ability to find the holes his offensive line is able to create. He certainly is an impressive for a first-year player, making the freshman All-America team this past Wednesday — the first Oregon player since Tyler Johnstone in 2012. 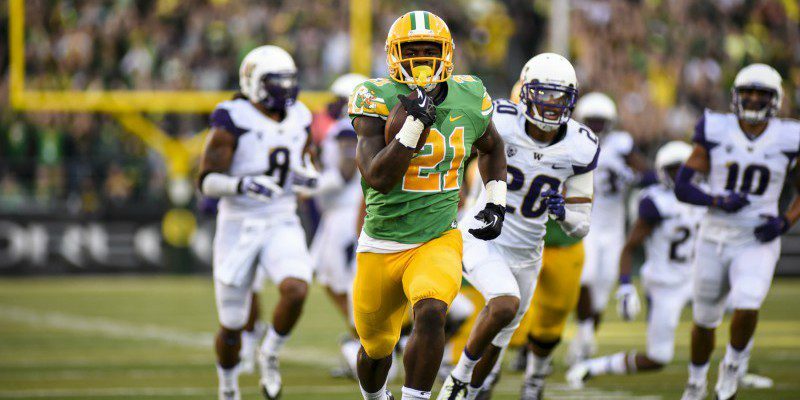 Royce Freeman had 75 yards and two touchdowns on just 10 carries in his first career game. The 2015 Ducks will be without Mariota, so an effective and heavy dose of the running game should take the pressure off of the first-year starting quarterback (unless it’s Braxton Miller, but that’s a topic for another day). In 2008, when Oregon played three different quarterbacks (Jeremiah Masoli, Justin Roper, Darron Thomas), the Ducks had their second duo in school history to rush for over 1,000 yards each in Jeremiah Johnson and LeGarrett Blount. Oregon could take a similar approach in 2015 with Freeman and Thomas Tyner. LaMichael James was the first-ever Pac-12 title game MVP. When LaMichael James finished 3rd in the Heisman voting in 2010, behind Cam Newton and Andrew Luck respectively, he rushed for 1,682 yards and 21 touchdowns; breaking the Pac-12 sophomore rushing yards record and Oregon’s single-season rushing touchdown record in the process. James is also the Ducks all-time leading rusher with 5,082 yards, and the career rushing touchdowns leader with 53. Considering James and Freeman both played heavily as freshman, Freeman could end up eclipsing James in one or both categories by the time he leaves school. Improving on an 18 touchdown season will be no easy task and Freeman wont surprise any teams in 2015. But all signs point to him being the real deal. Running backs coach Gary Campbell said “I think he is going to be a really, really special guy” before the season even started. It looks like he was right. The nation is filled with talented young running backs, Nick Chubb of Georgia and Samaje Perine of Oklahoma both of whom joined Freeman on the Freshman All-America list, and running backs don’t win Heisman’s anymore, as only two have won the award since 1999 (three times if you count Reggie Bush‘s vacated win). But, if the Ducks rely on Freeman next year and Oregon gets back to a New Year’s Six bowl, or even the College Football Playoff, Freeman could be getting an invite to New York in 2015.